Years ago I edited the Best 50 Pancake Recipes (Bristol Press) by Rachel Wylde. I’m not a big breakfast pancake-with-maple syrup gal, but Rachel pushed the pancake envelope well beyond the expected. We tried several of her savory pancake recipes and loved them. We’ve played around with versions of the classic potato latke for years. Golden pancakes fried in a lake of butter may tempt me in a restaurant, but I resist cooking with that much fat at home. So my first task was to find a way to make cakes crunchy while keeping the fat content below heart-attack range. Getting rid of as much moisture as possible is key. Grate the potatoes, rinse them if you wish, and drain for a bit in a colander. Put those taters in a clean towel and squeeze until your muscles burn. Or if you’re lucky enough to have a teenaged athlete in the house, call it an upper-body workout and hand the towel over. A little grated parm or asiago aids in browning as well, while adding flavor. Grated sweet potatoes add gorgeous color and beaucoup nutrients, but don’t expect serious crunch. If you’ve ever had sweet potato fries, you know that they stay fairly soft. We solve the texture issue by using half sweet and half Yukon gold potatoes. The orange and yellow strands tangle together in crisp, sweet-salty discs of deliciousness. But we’re not making those today. (Actually, you can substitute sweet potatoes for the zucchini in the recipe below, and there you have it.) The aforementioned Rachel Wylde made zucchini pancakes; this is my riff on her idea. Our favorite version is made with half potatoes and half zucchini. The pancakes crisp up nicely, and the shards of deep green zucchini add visual contrast as well as flavor and vitamins. If you have veggie-phobic kids, it’s a good way to sneak in some healthy stuff. 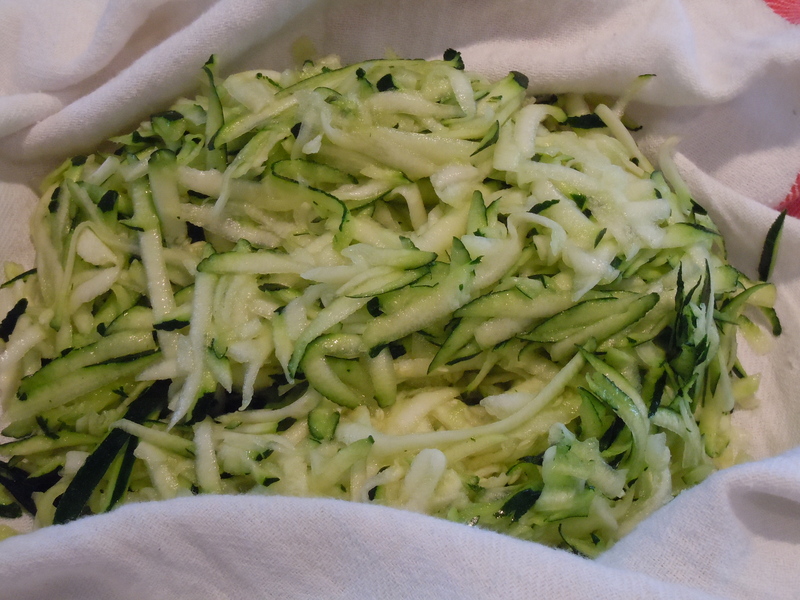 If the zucchini are large, I quarter them vertically and discard the seedy centers. If you’ve got firm, unblemished taters, leave the skins on. If I’m making a lot of these babies, I break out the food processor for the grating. Otherwise, I just use the large holes on the box grater; fewer dishes to wash. I prefer just enough egg and flour to barely bind the veggies. This way, you end up with crunchy, lacy discs. It’s like the chocolate chip cookie debate: do you want thin and crispy or plump and chewy? I like my cookies chewy and my pancakes crispy. A double-burner griddle is your best friend right about now. I bought mine, which has a grill pan on the reverse side, about a decade ago for about $50; you can find them for a lot less these days. Mine is no longer lovely—or rather, it shows the signs of having been loved and used well. If you don’t have a griddle, use two large skillets. If you’d actually like to eat dinner with your family and/or guests instead of sweating in the kitchen while everyone else scarfs up these beauties, you’ll need to keep the first batch(es) hot while you make the rest. A cooling rack set over a cookie sheet in a 250°F oven will keep the cakes from getting soggy. Peel the potatoes, if you wish, and grate in a food processor or using the large holes on a box grater. 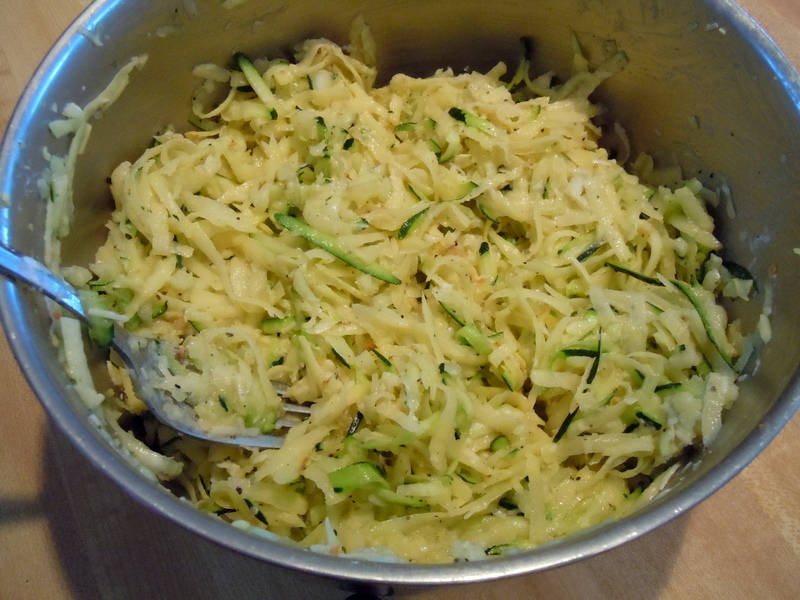 Grate the zucchini and onion and add to potatoes. Put them in a colander, sprinkle with salt, and set them over the sink to drain. Meanwhile, in a large bowl, lightly beat the egg. Beat in the flour, garlic, pepper, and Parm until well mixed. Place the veggies in a large kitchen towel and squeeze firmly to release as much liquid as possible. Use some serious muscle here! Dump the veggies into the egg mixture and stir well to combine. Melt 1 tbs. of the oil with 1 tbs. of the butter over medium-high heat in a large skillet or on a griddle. Add the potato mixture a scant ¼ cup at a time to the pan. Press on them to spread to about 1/2-inch thick. Cook for about 5 minutes without moving until the bottoms are well browned. Flip and cook for 3-5 minutes on the second side. Add more oil and butter as needed for each batch. Keep finished cakes warm in the oven. This entry was posted in appetizers, sides, veggies and tagged latke, pancakes, potato, potato pancakes, potatoes, zucchini. Bookmark the permalink. 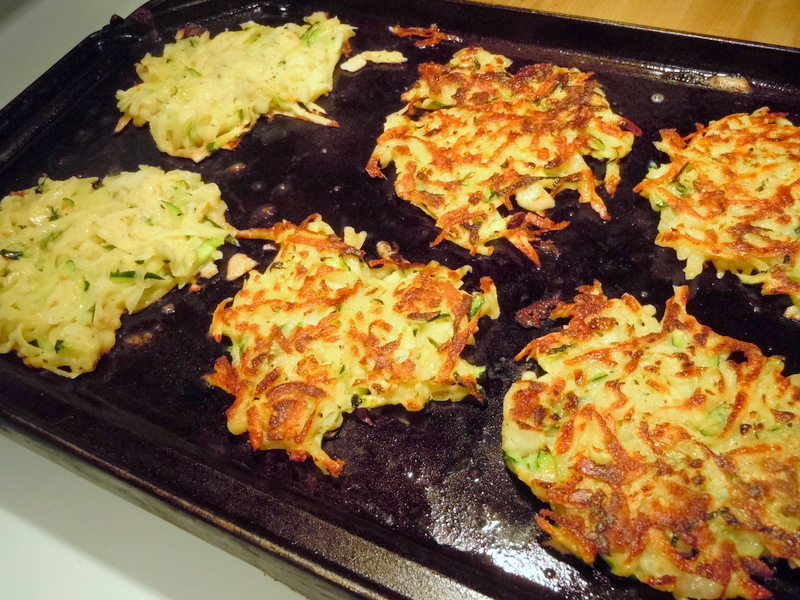 Thanks for the awesome idea for keeping the latkes/pancakes warm without them getting soggy! You’re welcome! Crispiness is the whole point–gotta have that crunch. OK, now I’ve actually tried the cooling rack over the cookie sheet in the oven and it made a HUGE difference. Then I come on to comment and see that I’ve missed waaay too much, especially because you’re writing about risotto. I don’t know if you remember but you made the best risotto I ever had in my life ages and ages ago in D.C. I’ve been trying to replicate it ever since. Thanks! Carrot are great in these too. I use 2 potatoes, one zucchini, and one carrot. I’ve been wanting to try carrots, and thought they might not soften enough. I’ll give it a go–thanks, Bethany! THIS, I have to make! I’m not a sweet pancake kinda girl either! Ever tried with carrots? I’ve always wanted to try them with carrots, but haven’t yet. Sweet potatoes work well, though.